IOFLOOD Review 2019: Is IOFLOOD a Good Hosting? IOFLOOD is a specialist website hosting provider. They rent enterprise-level dedicated servers to large websites and businesses. Founded in 2009, IOFLOOD is a relatively new player on the website hosting scene. They only provide dedicated servers, although they do partner with companies who offer shared and virtual private servers. They own and operate their own servers in a Tier III data center in Phoenix, Arizona. Their website and support are both in English. IOFLOOD is not a website hosting provider geared towards everyday users. They are designed specifically for businesses with large traffic volume or complex hosting needs. They only provide dedicated servers, with top quality hardware. 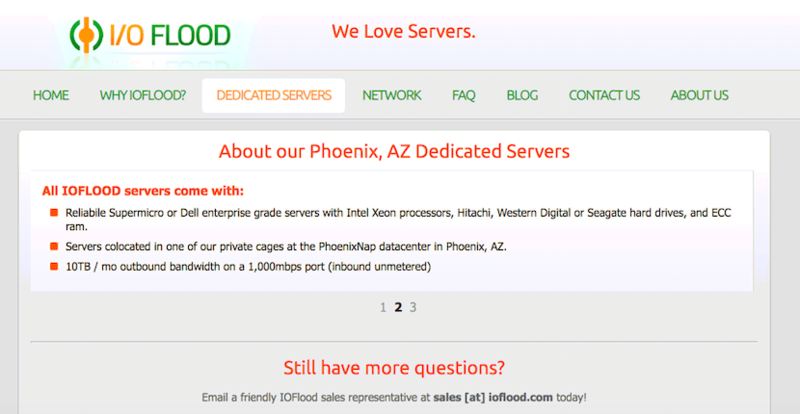 IOFLOOD uses top-class hardware housed in their own cages in a Phoenix datacenter. Unlike lots of other companies, they will not resell other companies’ servers and they do not outsource the management. Their team of engineers manages the servers on- and off-site 24/7, which means that you can enjoy a fast response time to issues and faster website speeds. They are committed to only using hardware they would use on their own server, e.g., Dell or Supermicro server-grade motherboards for stability, Hitachi or Western Digital hard drives for reliability and speed, with Intel processors for the high performance. What I really like about IOFLOOD, is their flexibility. They do provide a series of base configurations; Mega Dual CPU, Basic Dual CPU, Mega Single CPU, Prime Single CPU, Basic Single CPU, and Starter Server, however, they also allow you to customize each package as needed. For example, upon checking out, there are numerous ways to configure the server including but not limited to: hard drive size, extra hard drives, RAID options, disk partitioning, operating system, and much more. Getting set up is a smooth process. Even with all these customizations, they aim to get you live within twenty-four to seventy-two hours. Whilst the IOFLOOD website is complex and over-the-top for most beginners or new website owners, the process is straightforward for enterprise level businesses, and it can be done 100% online. IOFLOOD offers a full range of dedicated server base packages plus customizations, meaning they have a price point to suit most budgets and business needs. Even so, the price for the base packages of dedicated servers is in line with other U.S. companies offering similar services. What’s more, IOFLOOD’s dedication to quality is clear throughout. Billing is available on a monthly cycle only. There are no incentives for purchasing a longer term, nor is there a free trial. That said, they offer a 15-day money back guarantee which is unusual for dedicated servers due to the setup time required. They also allow you to upgrade or downgrade at anytime. On first glance, IOFLOOD’s customer service is limited as they only offer email support. While this isn’t ideal, I have to say, this company is great at solving problems. They very quickly respond to emails and usually solve issues within minutes. I typically like to see a live chat option, but I am confident in the quality of their support and know I will always receive a polite, helpful, and timely response. IOFLOOD are a team of server enthusiasts that are passionate about providing top quality servers to entrepreneurs. They manage their own servers within a Tier III data center. Wondering how IOFLOOD stacks up against other Web Hosting companies? Enter any other Web Hosting company and we will give you a side-by-side comparison.